This year’s Turner takes place in Hull’s newly refurbished Ferens Art Gallery, an institution opened ninety years ago. The exhibition is part of the final quarter of activity marking Hull’s stint as UK City of Culture, its stated aims being to: ‘draw on the distinctive spirit of the city and the artists… revolutionaries and thinkers that have contributed to the development of art and ideas’ , both regionally and nationally. As a port and former shipbuilding city, Hull historically enabled national colonial and imperial expansion built on slavery, yet later famously fostered the abolition movement—spearheaded by William Wilberforce, who remains much celebrated in the city. That the exhibition should take place in a gallery established by the late MP Thomas Ferens—local industrialist, early supporter of womens’ suffrage, and campaigner against the trafficking of women and girls in the British colonies—is fitting. The work of the four shortlisted artists shown this year displays a trend towards examining aspects of colonial legacies, reflecting a similar drift in mainstream discourse around UK contemporary art. That significant works on display are years, even decades, old speaks less of misjudgement in selection, and more of how these works remain as urgent and relevant as they were ten, twenty, thirty years ago. This surely rings true for many working in the capital’s arts industry now. A veteran of the UK black art scene, Himid’s work addresses legacies of colonialism and slavery: she is noted for her acerbically satirical figures pictured as either quietly propped up by systems of racism and associated atrocities, or patently bemoaning their downfall. The extensive ceramic work ‘Swallow Hard: The Lancaster Dinner Service’, 2007, further reveals Himid’s roots in theatre set design: a lurid procession of white 18th and 19th century aristocratic types are painted on mismatched platters, dishes, butter canisters and tureens: a cast nestled among delicate renderings of British flora, meditative black figures in profile and the ghostly skeleton of a ship—Hope II . But it’s the underglaze pattern of the dinnerware that challengers the viewer, reflecting ingrained, systematic attitudes and insidious biases built into the very fabric of society and more literally, in common commodities. 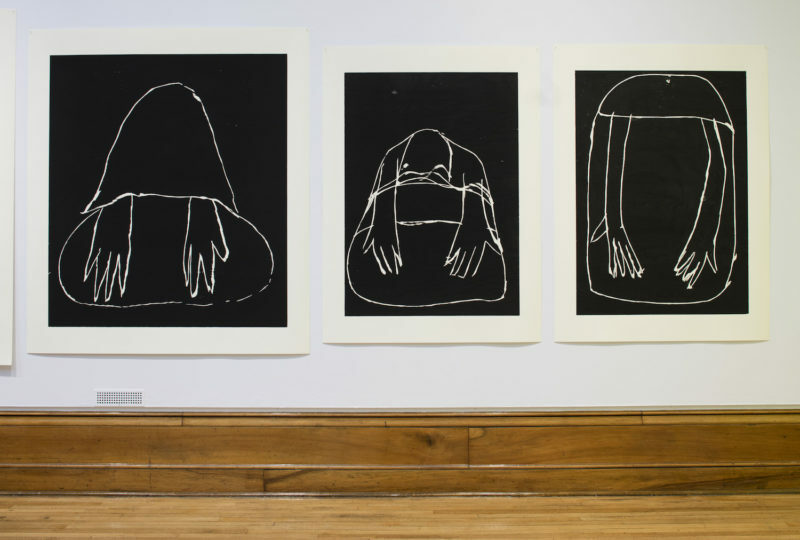 The inclusion of these older works is welcome, and of the shortlisted artists Himid feels most connected to the history of Hull through her close up exploration of the legacy of slavery. ‘Negative Positives: The Guardian Archive’, 2007–2015, brings her work closer to the present and consists of a selection of framed Guardian pages partially covered by painted panels of pattern. This is not only a literal archive of the portrayal of black subjects, but it also excavates the language of editorial design and questions how the pairing of stories, in black and white, create a narrative. Not everyone agrees: one Telegraph critic felt inclined to dismiss its simple presentation of fact as ‘dated… racial paranoia’ . In her film works Rosalind Nashashibi employs a level of characterisation that chimes with Himid’s. 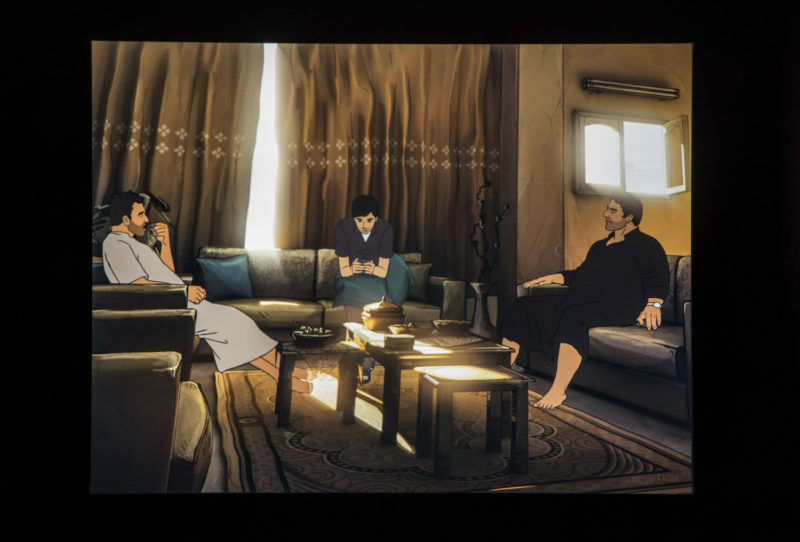 Noted for her portrayal of communities isolated or closed off in some way, ‘Electrical Gaza’, 2014, mixes footage of the thronging crowds of Gaza’s towns with animated sections. Although she is portraying strangers, the film shoots from the perspective of an insider, privy to all the knowing glances and unconscious communications between individuals and groups. After watching Nashashibi’s works in succession, the artist’s treatment of her subjects has an intelligent simplicity of epically universal proportions. ‘Electrical Gaza’ teems with people: young men watch their friends pull up in a car and a seemingly insignificant, recognisable scene is played out: little hand waves, flashes of recognition through the glass—good friends reuniting as they do everywhere. The crowd at a large gate clamours, behaving with the collective rhythm of eager crowds everywhere. In Nashishibi’s films, the day-to-day doings of her subjects often show them trapped in their geo-political circumstances: from the exhibition catalogue we learn that the crowd at the gate is anxiously trying to cross the Rafah Border into Egypt, hoping to meet loved ones, go to work or get medical attention. The groups of young men greeting one another are doing so just before Operation Protective Edge, Israel’s most recent military action against Gaza: living in a time and environment hostile to their very existence—both in war and in relative peace. Whereas in ‘Electrical Gaza’ the lens (though uninvited) is one of the crowd, ‘Vivian’s Garden’, 2017, is unmistakably shot from the perspective of an outsider, though the artist is clearly welcome in the home of the women it features. The two Swiss/Austrian artists, mother and daughter, live as wealthy immigrants in the Guatemalan jungle. Through instances of daily life, the film exhibits the dynamics of care between these two and others in their lives—mother and daughter, mother and helpers, pets and owners. Through this reality, Nashashibi picks up on the dynamics of power: wealthy expats and local hired help, men and women, inhabitants and newcomers. The gate to the womens’ property, like that of the Rafah Border, is drawn as a challenging threshold, the entry point into a thick, impenetrable tree filled canopy in the tropical garden. The atmosphere is oppressive and through the wide-eyed prattling of the women, filters a constant sense of threat, real or imagined. 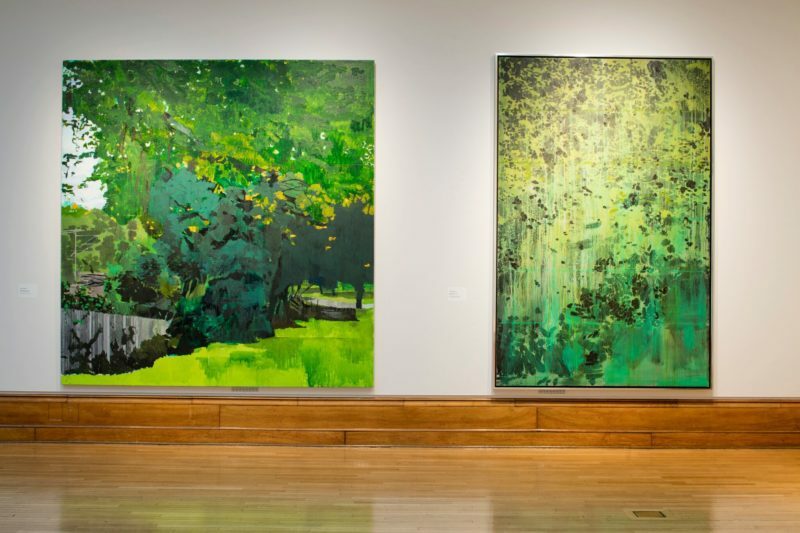 Trees also figure prominently in the work of Hurvin Anderson: large, densely-layered paintings such as ‘Greensleeves’, 2017, ‘Last House’, 2013, ‘ Northern Range’, 2010 and ‘Across the Tracks’, 2013 cluster to create a pleasing sense of arboreal richness: words like ‘lush’ and ‘verdant’ come to mind instantly. Anderson recalls seeing boys picking mangoes in Jamaica, a scene that triggered memories of his own brother scrumping apples in Birmingham in their youth. Even a prominent pear tree near his south London studio figures in fragments. Anderson’s paintings remind me of Dexter Dalwood’s 2010 Turner Prize exhibition. That year, I was a student at Hull College, and we were all carted down to London to see the show. The notion then that the Turner Prize could ever be held in Hull would never have entered our heads. Anderson’s paintings, though formally quite different from Dalwood’s, have that same strange, illusory sense of unfolding, an atmosphere heavy with expectation that seems to come from paintings steeped halfway towards fiction. Lynette Yiadom-Boakye’s work has similar mystery. Layering and adjusting the alignment and re-alignment of images and perspectives over one another gives Anderson’s paintings an additional depth in and of themselves. His work most obviously pairs with that of Andrea Büttner, which is significantly presented in more formal terms than Himid’s and Nashashibi’s. Büttner’s varied practice encompasses printmaking, sculpture, painting, film and collaborative projects, and touches on subjects as wide-ranging as botany, Catholicism, philosophy and art history. Most striking is ‘Beggar’, 2016, a series of nine large woodcuts examining Ernst Barlach’s sculpture ‘Cloaked Beggarwoman’, 1919, from the front, which Büttner uses as a springboard to examine notions of shame, poverty and religious redemption. Though the impressive breadth and intellectual depth of Büttner’s practice is presented with gentle humour and a wide-ranging mastery of process unparalleled by the other shortlisted artists, her work seems less convincing in this group context, in comparison to the completeness and visceral richness of the others. Much has been made of the removal of the upper age limit this year—previously capped at 50—which should be welcomed as an opportunity to see multi-generational work communicating on the same stage.